If you are like me, Valentine’s Day is not the same unless you have chocolate. Nothing like decadent chocolate that melts in your mouth. I love to eat it and give it as a gift. I think making your own candy makes for such a wonderful gift to give, to the one you love. 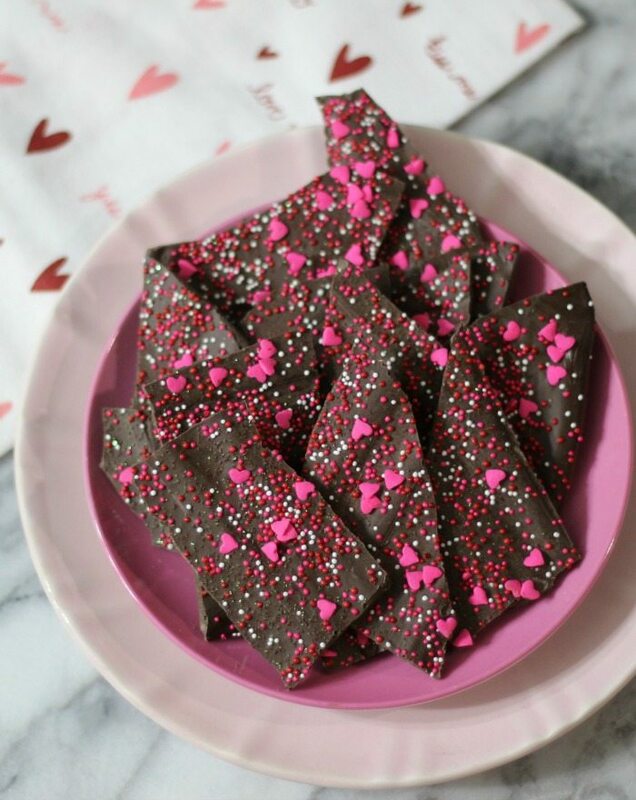 Today’s recipe is very simple Valentine’s Day Bark that takes a few minutes to make and only contains a couple of ingredients. Plus, if you give it as a gift, that person will think you spent hours on it. he he Little do they know, it only takes about 10 minutes to make and about an hour to chill. Package it up in a pretty box and you are good to go! I feel the key thing is having a good quality chocolate. I used Ghirardelli Dark Chocolate Wafers. The chocolate tastes amazing and is so smooth. It just melts in your mouth. I found it at Target and it is also available at most grocers. To make it pretty, I just used Valentine’s Day sprinkles to go over the top. I bought mine at Williams Sonoma, but I know you can find it again at Target and at your local grocers. I think even stores like Micheal’s will carry it. This was beyond easy to make, almost embarrassing if you ask me. All I did was melt my chocolate in a microwave safe bowl, for about 90 seconds and spread it onto parchment paper. Sprinkle the top with your Valentine’s Day Sprinkles and let it harden. Break it into chunks and that’s it. Since I used chocolate wafers and not baking chips, there was no need to refrigerate it. Unless your house is pretty warm. The chocolate melts in your mouth and you get a little crispness from the candy on the top. 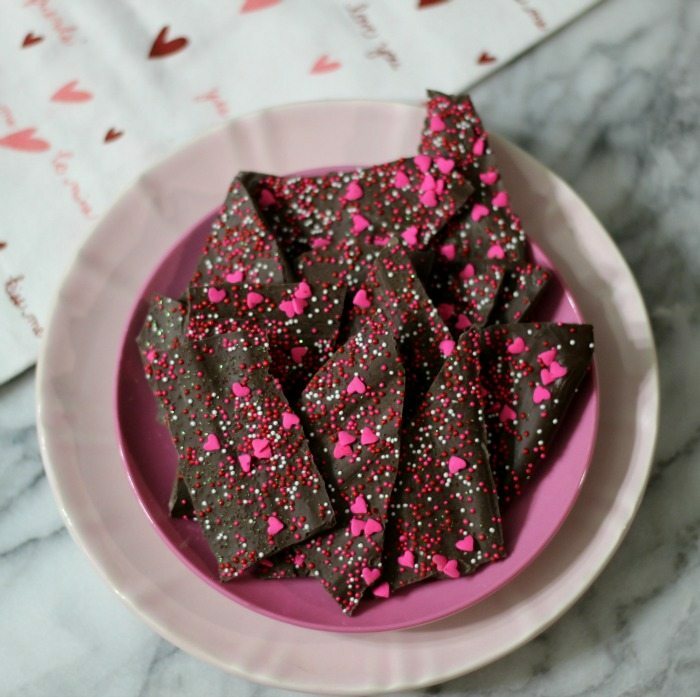 It’s truly a perfect candy and certainly satisfies the chocolate cravings I have. I have them quite often. Funny, when I eat spicy, which seems all of the time, I crave a sweet chocolaty treat afterwards. Are you that way too? 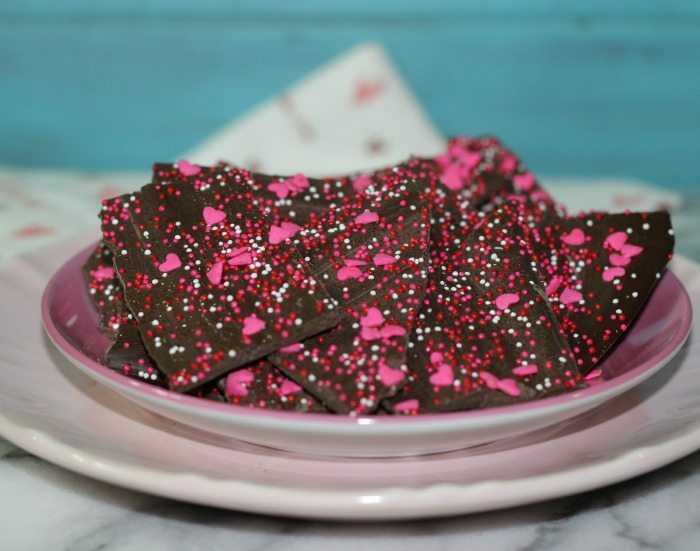 A rich, melt in your mouth chocolate that has Valentine's Day sprinkles. Very easy to make and perfect for gift giving. In a microwave safe bowl, melt the chocolate in 30 second increments until melted; stirring in between. 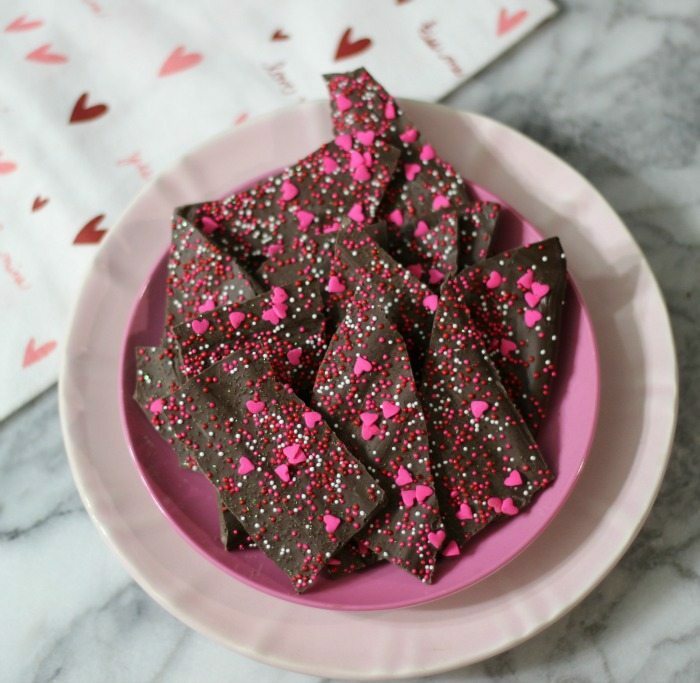 Pour the chocolate onto the prepared parchment paper and spread till about a ¼" thick. I may have spread a little thinner. I spread it into the shape of a rectangle. 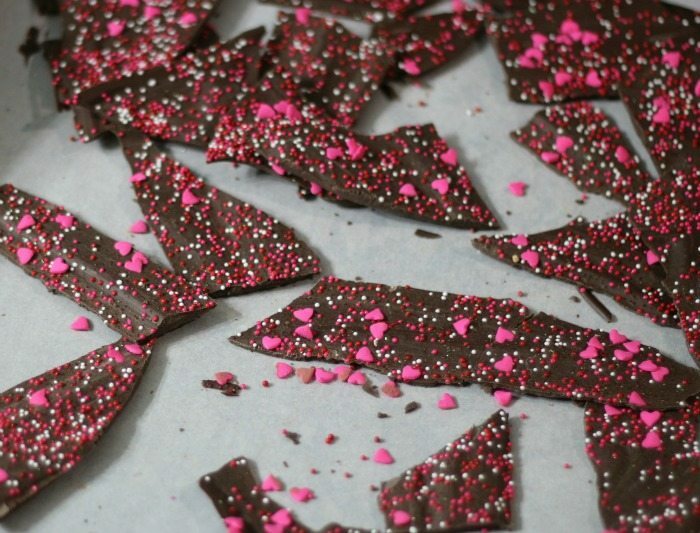 Sprinkle the top with valentine's sprinkles. I lightly pushed them in to stick. Let cool on the counter for at least one hour until completely cooled and hardened. You can refrigerate, but it will take the gloss out of the chocolate. Break into about 20 pieces. I just love simple recipes like this and it was a pure hit with friends and family. 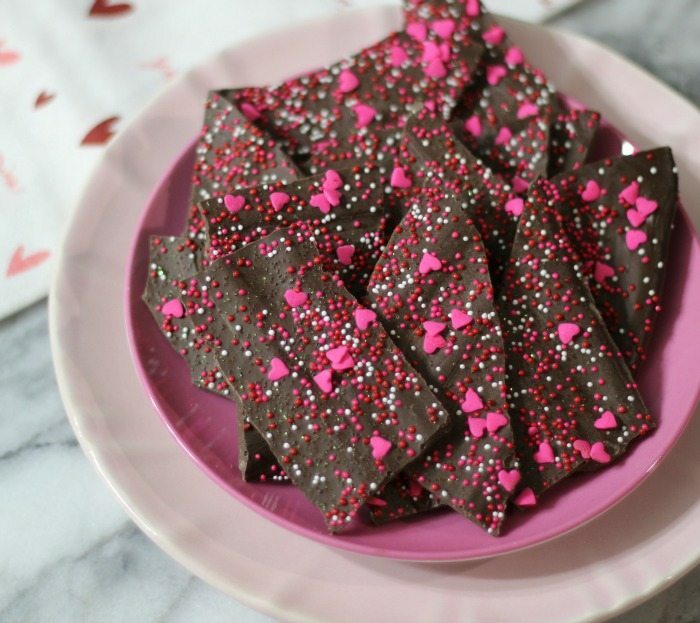 I just know the chocolate lovers in your life will just love, love, love this recipe. I looooove dark chocolate! This bark is pretty pretty and looks taaasty tasty!